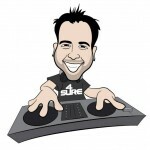 Dj Ryan Levin, is a real cartoon. He is silly, fun, and great for kids! Hi, I’m Ryan. Thank you for taking a moment to read this page. My Bar Mitzvah was February 7, 1998. The party was the following Sunday. I walked into the room to “The Men In Black” by Will Smith, wearing a black suit, black glasses and a smile from ear to ear exposing my braces. I grabbed the microphone, and in the highest pitched voice, I thanked everyone for coming, and my parents for throwing such an amazing event. When the party was over, I wasn’t satisfied. As a 13 year old boy, I did NOT want that party to end. Lucky me… I have a sister, she’s just two years younger then me… I couldn’t wait until her Bat Mitzvah. I wanted to continue the party. I wanted to win the hoola hoop contest, I wanted to be on stage facing the crowd like the dancers, I wanted to be a bigger part of the party… more than just the brother. After that night, I was offered a job. I was told to come to a “Wednesday Night Practice” My first event was June 2000. Parents, think about it… I was preparing for your child’s mitzvah as they were being born. This is my Mitzvah year of djing. My number one goal, is to make sure your child remember their event the same way I remember mine! How can I help you now? I’ve been doing this on my own for over five years, and through out the time i have made some great connections. I can help you find the best pricing on Bar Mitzvah Invitations, Mitzvah favors, and Giveaways. I can help you come up with great bar mitzvah ideas and bar mitzvah themes. I can help you with all your bar or bat mitzvah planning. Remember its important to have centerpieces, photography, and good entertainment. 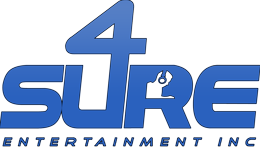 Keep 4 Sure Entertainment in mind for your kids upcoming mitzvah.